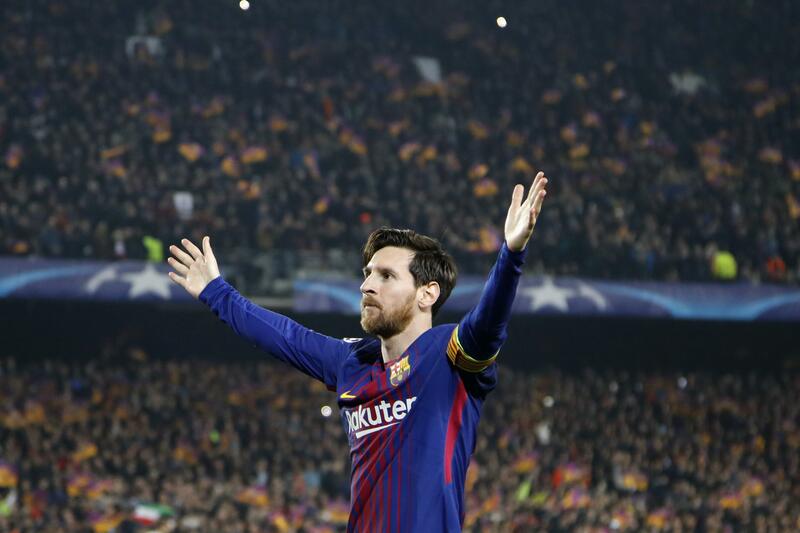 Wed., March 14, 2018, 3:34 p.m.
BARCELONA, Spain – Lionel Messi joined Cristiano Ronaldo in the Champions League’s 100-goal club after scoring twice to lead Barcelona past Chelsea and into the UEFA Champions League quarterfinals for an 11th straight season on Wednesday. Messi also set up Ousmane Dembele in a 3-0 win at Camp Nou after he had scored Barcelona’s goal in the opening-leg 1-1 draw in London. Messi beat Thibaut Courtois with two strikes between the Chelsea goalkeeper’s legs from very tight angles on the side of the box. He struck the opener three minutes into the match and took Barcelona’s third goal in the 63rd. Ronaldo, with 117 goals, is the only other player to reach the century-mark in Europe’s elite club competition. Messi reached his 100th goal in 123 matches, while Real Madrid’s star needed 144 games. But the most dazzling moment from the Argentina forward, who returned from missing one match for the birth of his third son on Saturday, came when he helped Dembele score his first goal for Barcelona after he stole the ball from former Barcelona teammate Cesc Fabregas and darted past two would-be tacklers in the 20th. Barcelona remained unbeaten in 25 straight Champions League matches at Camp Nou, a run that dates back to 2013. The hosts also stayed in contention for a rare treble of titles. They lead the Spanish league and have reached the final of the Copa del Rey. Chelsea will now have to focus on finishing in the top four in the Premier League to return to tournament. It is currently in fifth place. Also on Wednesday, Bayern Munich won 3-1 at Besiktas to advance 8-1 on aggregate. Thiago Alcantara and Sandro Wagner scored for Bayern and Gokhan Gonul’s added an own goal. Barcelona coach Ernesto Valverde chose to start Dembele over midfielder Paulinho, who played the match in London which Chelsea largely dictated. The decision proved the right one when Messi linked up with the young winger to double the lead. Iniesta returned from a muscle injury in his right leg suffered 10 days ago to play the first hour for Barcelona, before he was substituted by Paulinho with the win in hand. Chelsea boss Antonio Conte looked to repeat the team’s relative success at frustrating Barcelona’s attack from the first leg with its back line of five defenders. But Messi needed very little to poke a hole in Chelsea’s wall. Barcelona’s all-time leading scorer started an attack with a pass meant for Dembele that was twice deflected before Luis Suarez deftly flicked it back to Messi. The Argentine targeted the only gap available: the slot in-between the legs of Courtois. The second came after Messi swooped in to steal the ball from Fabregas in midfield and charged toward the box. After letting Suarez draw the remaining defenders to him, Messi passed across for Dembele to drive a rising shot over Courtois. Dembele’s first goal for Barcelona came in his 12th appearance for the club. The goal could represent a breakthrough for the 20-year-old France winger, who had been hesitant and error-prone in his previous games after recovering from two injuries since his move from Borussia Dortmund that could reach 147 million euros (about $173 million). Despite getting nothing from striker Olivier Giroud, Chelsea continued to press for a goal and came closest near the end of the first half. Willian and Eden Hazard both drew saves from goalie Marc-Andre ter Stegen and defender Samuel Umtiti before Marcos Alonso then sent a free kick off the post in injury time. Dembele also contributed in defense when he hustled back to make a clean tackle of Alonso when he was preparing to shot from close early in the second half. Messi made sure of the victory when he received a pass from Suarez and sped around a group of three defenders before humbling Courtois with a second strike between the legs. Antonio Rudiger came closest to a consolation goal for Chelsea, but his header hit the crossbar in the 90th minute, adding more near misses to Willian’s two shots off the woodwork from the first leg. Published: March 14, 2018, 3:34 p.m.